It’s easy to get into a cooking rut when you’re on a keto diet. All of a sudden, you can’t have all your favorites — Italian, Mexican, Chinese — especially cuisines that have a lot of pasta and noodle dishes. That’s where you have to get creative. In this keto chicken cabbage stir fry, you’ll get all the flavors of your favorite Chinese noodle stir fry, with just a fraction of the carbs. And you’ll do that by making tender cabbage “noodles” and pan-frying them for perfectly fried cabbage that’s both tender, savory, and has a bit of a crunch. This dish is perfect for your low-carb, ketogenic meal plan. It’s easy to make and stores well in the fridge for days. The ketogenic diet is rich in low-carb vegetables, and that means tons of antioxidants, vitamins, and minerals. But something else has a surprising amount of antioxidants, and that’s grass-fed ground beef. Despite getting demonized in the media, grass-fed (not grain-fed) ground beef has high levels of antioxidants, omega-3 fatty acids, and CLAs (conjugated linoleic acids). All of these compounds contribute to fighting against harmful free radicals, which means less oxidative damage. And less oxidative damage means less disease. Research shows that CLA can reduce the risks of many different diseases, but one of the most significant is cancer. Just another reason why choosing organic grass-fed over conventionally-raised beef is so important[*][*][*]. Cabbage — the real star in this stir fry recipe — is also rich in antioxidants. Antioxidants like vitamin C may protect against DNA damage, which means protection against numerous disease, including cancer[*][*][*]. Garlic, well-known for its antibacterial properties and bioactive sulfur compounds, may also protect against cancer formation[*][*]. And onions are one of the most powerful anti-cancer foods you can eat. They’re rich in antioxidants and protective sulfur compounds, all of which strengthen your body’s cancer defenses. Numerous studies have linked onions to the fight against cancer, including breast, colon, prostate, and other common occurrences[*][*][*][*][*][*][*]. Again — against all popular opinion, grass-fed beef has a number of heart-healthy properties. It’s a good source of omega-3 fatty acids, which have been shown to lower cholesterol and inflammatory markers[*][*]. Cabbage is also rich in anthocyanins. Besides giving cabbage their unique color, these compounds can significantly reduce the risks of heart attack and cardiovascular disease[*][*]. Garlic also aids in strengthening your heart health. Multiple studies have shown that garlic can help reduce plaque build-up in your arteries, improving your heart health, lowering blood pressure, and increasing blood circulation[*][*]. Onions contain a rich supply of antioxidants and minerals like quercetin and potassium, which can contribute to lower blood pressure and overall better heart health [*][*][*][*][*]. Grass-fed beef — with its impressive levels of CLA — has been shown to balance blood sugar levels[*]. Cabbage is a great source of soluble fiber and phytosterols, which may help decrease LDL cholesterol[*][*][*]. And numerous studies have linked garlic to reducing LDL levels, increasing circulation, and improving blood sugar and insulin response in diabetic patients[*][*][*][*]. Onions also help to regulate LDL levels and are excellent for circulatory health overall. What makes this low-carb recipe so perfect is its versatility. The classic Asian flavors make it ideal for adding additional low-carb veggies or trying different types of protein, like steak or shrimp. You can even try a vegetarian variation as a healthy side dish with added broccoli, cauliflower, or Asian vegetables like bok choy or mustard greens. ffer satiating protein, plenty of fresh veggies, and a small dose of healthy fats. 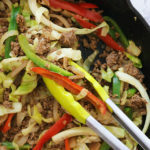 Quick and easy keto stir fry with cabbage noodles — just cut cabbage noodles and toss in a frying pan for a sweet and slightly crunchy low-carb alternative to pasta. Heat a tablespoon of olive oil in a large frying pan over medium-high heat. Add chopped garlic and cook for 30 seconds to a minute. Add diced onion. Cook for 5-7 minutes or until translucent. Increase heat to medium-high. Add the remaining olive oil and the ground beef or chopped chicken breast. While that’s cooking, chop up the head of cabbage into long strings like noodles. Add the cabbage, bell pepper, and coconut aminos. Season with ground ginger, sea salt, and black pepper. Stir for 3-5 minutes until the cabbage is tender. Top with your favorite dressing and seasoning; option to serve over cauliflower rice.